How to catch salmon in Michigan Rivers. One of the best how to tips for Michigan Salmon is casting Thunder sticks for Kings in early morning. How to rig the Thunder stick is the key. (1) Remove the split ring on bill, then use a cross lock snap to your main line. The cross lock is stronger and allows the lure to swim freely. It’s also a very quick way to change lures or colors. (2) Double Split ring on the tail hook. Single Siwash hooks hold fish better. King Salmon love to spin while hooked. A double split ring – Single Siwash keeps salmon from throwing the hook. Casting Thunder Sticks for Michigan Salmon. Add a cross Lock Snap and a single hook. This helps land more King and Coho Salmon in Michigan rivers. Less Line Twist – Soak spool of line in hot water. Makes casting a lot smoother & takes out line twist. Pro Tips for Michigan Salmon Fishing… Have you ever experienced line twist when applying new monofilament line to your spinning reels? 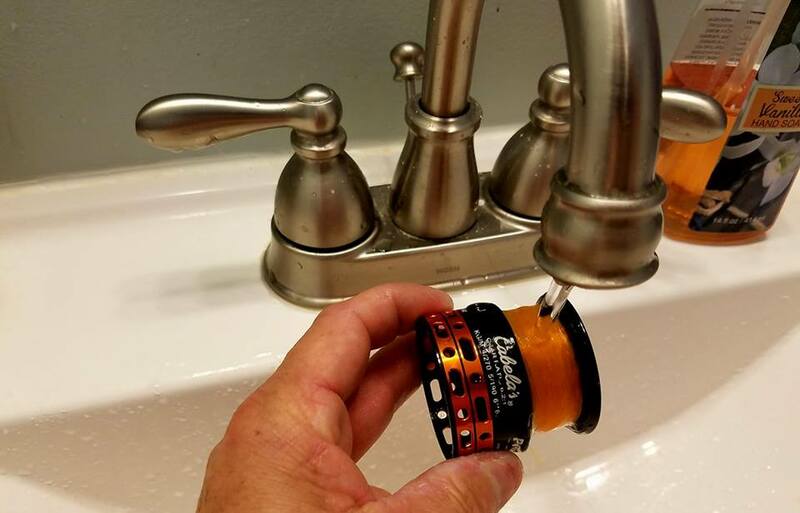 Hold your newly filled spool under hot tap water. In this process, the hot water softens the fishing line, and changes the “Service spool” to the “Reel Spool” memory” to fit the new spinning reel spool. Thus allowing for longer, twist free, smoother cast!!! Hot tap water is best, when the line cools, it will take the shape of the smaller spinning reel spool and make for much easier casting with less twist. Skein Fishing for King Salmon on the Pere Marquette & Big Manistee River below Tippy Dam is a very effective technique. Cut the skein into small chunks. (Quarter sized or larger) Place skein eggs on the hook using an egg loop knot. Using an 8 gram float, rig up a slip style egg sinker and 30″ leader to the hook. I usually use 15 lb fluorocarbon leader. Adjust the float set up to half the depth of the water. Salmon have a keen sense of smell. Covering human scent is a major key in catching salmon in Michigan rivers. Wearing nitrile gloves while handling eggs and bait certainly helps. Take care to wash your hands in river water before touching your bait. Once the bait is on the hook never let it touch the floor of your boat, where it may pick up the smell of oil or gasoline. Be especially careful not to have strong smelling scents such as sunscreen, gasoline or cigarettes on your hands when touching bait. And don’t be afraid to use attractor scents to increase the appeal of your bait. Skein fishing for King Salmon in Michigan. Fish chunks of skein eggs under a bobber for salmon during the day. 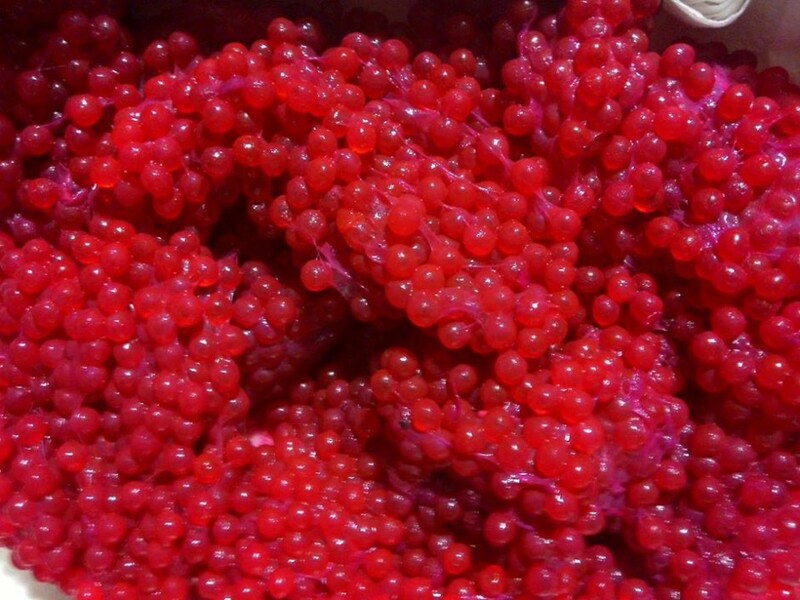 Fishing eggs for salmon is very productive. ​Want to catch Salmon in Michigan Rivers? Here are some pro tips, fishing hacks, and how to tricks for better salmon fishing in Michigan. How to catch more salmon in Michigan’s Manistee, Pere Marquette, and Muskegon Rivers.